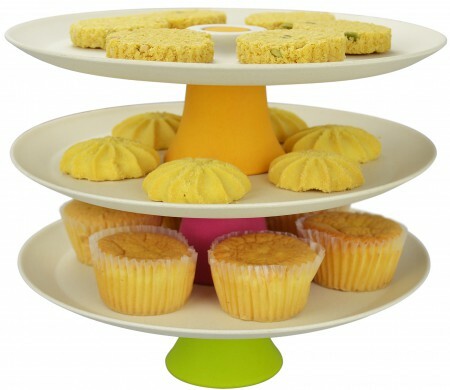 3 cupcake plates with stands. Serves food in style as one, two, or three stackable tiers. or used as 3 individual dessert plates. Serving cake, candies, dessert, bread, fruit, etc. The perfect addition to any celebration, birthday party, wedding, holidays, gathering events, etc. Serving cake, candies, dessert, bread, fruit in style as one, two, or three stackable tiers display stands, or used as three individual dessert plates. Made of new material Bamboo Fiber, biodegradable and eco-friendly. Dishwasher safe. The perfect addition to any celebration, birthday party, wedding, holidays, gathering events, etc.